All of our guest rooms are non-smoking, however, guests are welcome to smoke on the balcony of their room, or outside the hotel. Breakfast is served at the Rise and Shine Breakfast Buffet and includes Scrambled Eggs, Sausage, Pancakes, and more. Our outdoor pool area is open seasonally from 8am til 11pm. Creekstone Inn offers a two-level parking garage beneath the Creekstone Building. The Rivers Landing building has its own parking lot. Additional parking is available across the street, near the pool. There is no parking fee. No, we do not offer laundry facilities. No. We do not have an on-site fitness center. There is a Pigeon Forge Trolley stop at our hotel. 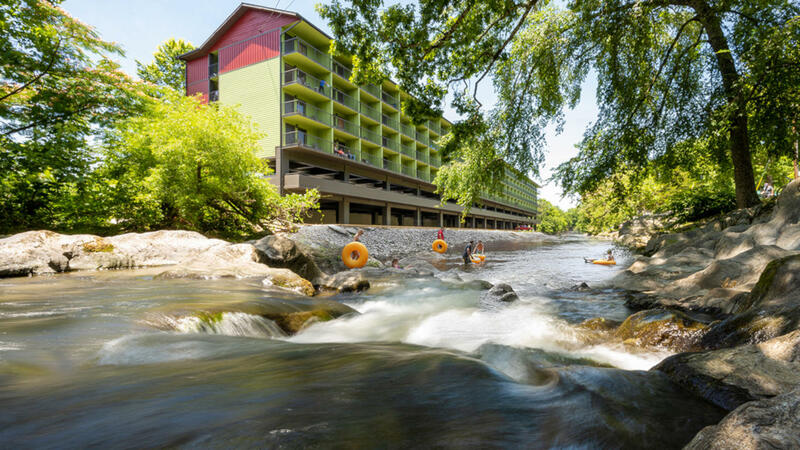 Every room at Creekstone Inn features a balcony overlooking the Little Pigeon River!